There's something amazing about seeing a diverse group of people come together, especially when they’re from all different backgrounds and faith communities. This is precisely what the Interfaith Build Project is all about: a unique initiative that began in 2015 for people from all faith communities to put their faith into united action. 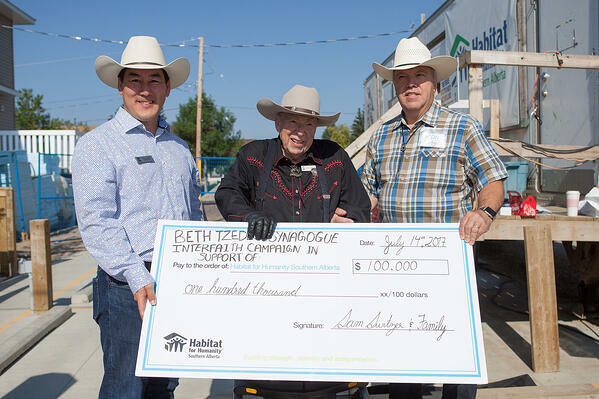 Collectively, they set an ambitious goal to raise $1,000,000 to help build 10 affordable Habitat for Humanity homes for working families in Southern Alberta. Fast forward to today and this motivated group has rallied the support of nearly 30 faith groups and more than 500 donors, and raised more than $800,000 to help families through Habitat for Humanity. This generosity has helped to fund two homes in Pineridge Place, one four-plex in Bowness, and one five-plex in Bowness. Funds will also be put towards our future legacy build in Silvercreek, along with homes in a few rural communities outside of Calgary. From Build Days to concerts to a toilet named Johnny Cash (yes, a toilet), seeing the dedication and generosity of so many people is nothing short of inspiring, and you can’t help but feel some warm fuzzies inside. That’s why we’re highlighting some of these fun and memorable moments along the way – they showcase the incredible things that happen when people come together. So, if you’re looking for your daily dose of inspiration, or just need a few minutes to read about some good happening in the world around you, check these out. Sam was a local business legend and also a member of the Beth Tzedec Synagogue, which has been an integral part of the Interfaith Build Project. Although Sam originally committed $50,000 to the project, Rabbi Shaul Osadchey's passion for the project inspired him to double his original pledge! Sam and his son Ron joined us at the Pineridge Home Dedication, where he welcomed the future homeowners into the community with a big grin on his face. Pineridge Place is now complete and is home to 24 families and more than 75 kids. Two of these homes were funded by the generosity of donors to the Interfaith Build Project. On August 24, 2016, 30 local clergy members from several congregations, including Westside Kings Church, Kensington Commons, Beth Tzedec Synagogue and Woodcliff United Church – just to name a few – came together for the inaugural Interfaith Clergy Build Day. Together, they poured concrete posts, painted deck boards, and built fences for an accessible duplex in Redstone that would later become home to two families, including Jeffrey, Suzanne, and their five kids Autumn, Zoe, Carmella, Finley and Jacob. 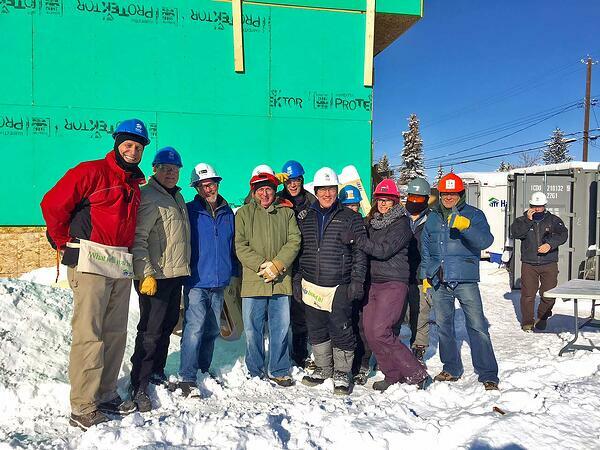 Since then, there have been eight dedicated Interfaith Build Days, which have raised several thousand dollars. A hearty group even braved minus-twenty-five degree temperatures for the cause. Can you say hand warmers and ear-muffs? Adam Bedford of Westside Kings Church has been there since the beginning of this initiative, and his church continued to be involved in multiple ways over the past three years. “Habitat provides us with opportunities to serve alongside people we wouldn’t get to meet otherwise. When those kinds of encounters take place, the serving becomes not just a blessing to those we help, but to us." 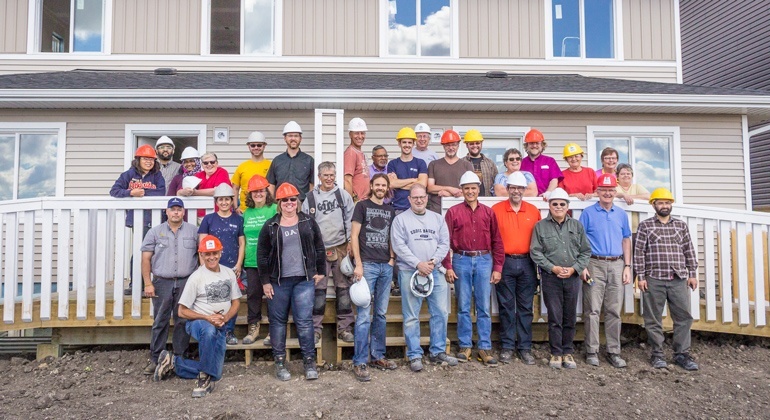 They participated in a unique Build Day, where they built alongside and mentored clients of the Calgary Dream Centre, demonstrating how service can have an enormous impact in the community. Building bridges while building community – that was the notion that sparked the idea for this interfaith musical experience. Dalton Harding of the Church of Jesus Christ of the Latter Day Saints was instrumental (pun intended) in turning the idea into a reality more than two years ago. “It is such a special privilege to be involved in this memorable musical experience that builds bridges of goodwill between our interfaith communities." And memorable, it has been! Over the past two years, these concerts have featured musicians from Jewish, Christian, Catholic, Mormon, Sikh and Islamic communities. 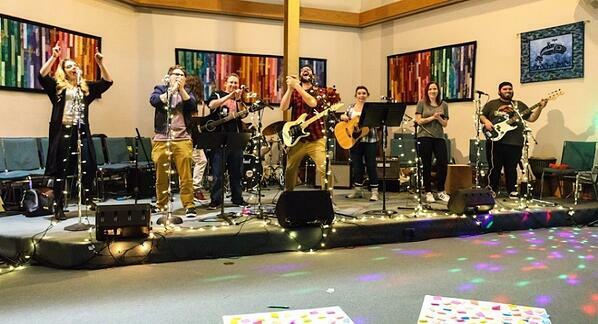 From drum troupes and string trios, to chorale groups and choirs, each evening has featured a myriad of talents and the events have raised nearly $30,000 for the Interfaith Build Project. A crowd favourite each year has been “All God’s Children” – a choir of kids from an entire cross-section of faiths. Next year, the completion of the Interfaith Build Project will be marked by one final concert to celebrate the diversity and goodwill that has been shown among faiths and the impact we can have when we all come together. 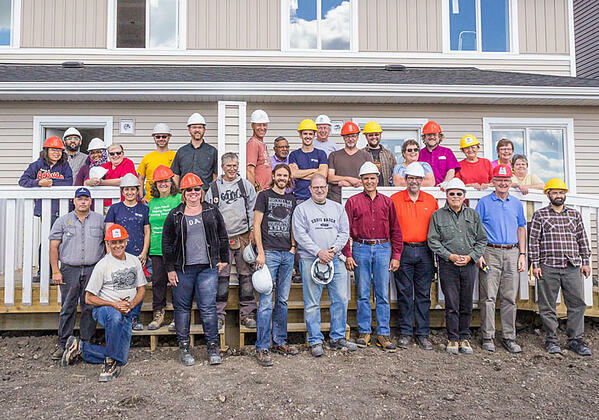 Woodcliff United Church and Robert McLure United Church have been enthusiastic supporters of Habitat for Humanity and the Interfaith Build Project. Woodcliff made a five-year commitment and has participated in Build Days, hosted a benefit concert – featuring the sounds of Banff folk musicians, The Wardens – and put on a Christmas fundraising campaign, aptly named "Homes for All." They’ve even involved the next generation of generous givers! 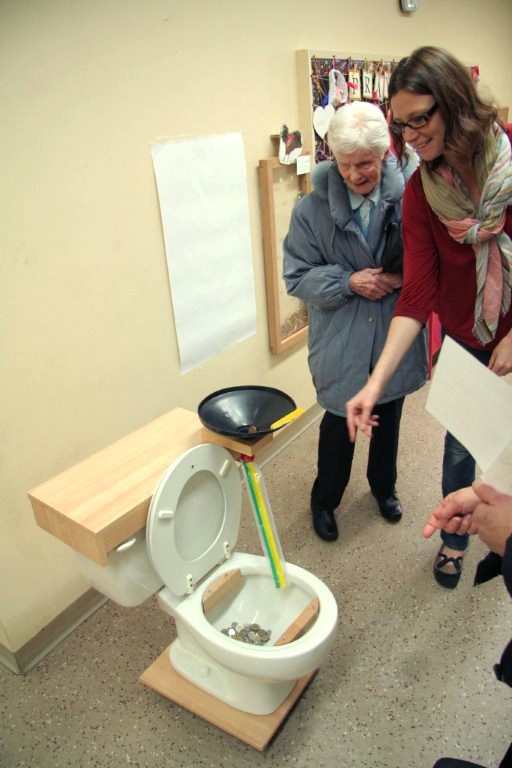 Children from the congregation have gotten involved in collecting change and wheeling around a portable toilet bank – punning-ly named “Johnny Cash” – and have requested donations in lieu of birthday gifts. Our friends at Robert McCLure have also taken on all kinds of tasks, from making lunches to feed hungry volunteers, to participating in Build Days and raising an incredible $1,900 through a congregational campaign. All these efforts – large and small – have contributed significantly to the Interfaith Build Project and are having a lasting impact in the community. The Roman Catholic Diocese of Calgary and Anglican Diocese of Calgary have both been instrumental in the dramatic growth of this campaign. 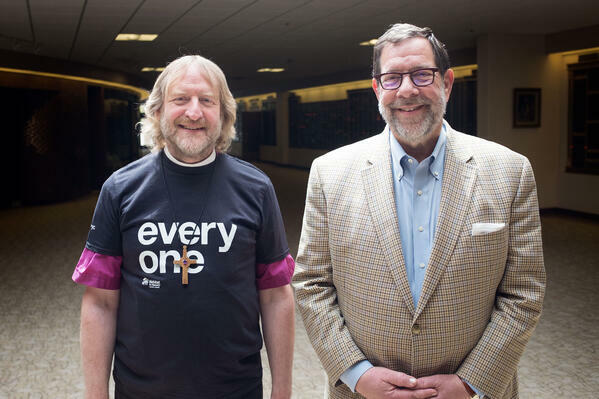 Archbishop Greg Kerr-Wilson, who co-chairs the Interfaith Build Project, pledged $200,000 on behalf of the Anglican Diocese and Bishop William McGrattan of the Roman Catholic Diocese of Calgary added a pledge of $300,000. This generosity will help to fund three developments in Calgary - Bowness, Pineridge and Silvercreek - as well as future builds in a few rural communities outside of Calgary. Along with their generous gift, the Catholic Diocese has engaged their youth in the campaign by organizing several Build Days with local Catholic high schools and parish youth groups. Well, that’s good, because you can still help us cross the finish line! We’ve got $200,000 to go to get to the million dollar mark by next June. Together, we will help 10 local families buy their first home and build strength, stability and independence. Here are three ways you can make a meaningful contribution in the spirit of interfaith harmony. Participate in an Interfaith Build Day on October 25 or November 8. Contact us for details. Organize a congregational campaign. Get in touch and we’ll send you a Congregational Guide. Make a donation that’s meaningful to you. It’s fast, easy and secure and you’ll receive an instant tax receipt!